The Monday night matchup on November 17, 1975 featured the Cincinnati Bengals, with their proficient passing offense led by QB Ken Anderson (pictured at right), against the Buffalo Bills and their outstanding ground attack keyed by RB O.J. Simpson. Under the guidance of 67-year-old coaching legend Paul Brown, the Bengals were 7-1 and fighting it out with Pittsburgh for supremacy in the AFC Central. Meanwhile, Buffalo, coached by Lou Saban, was 5-3. The Bills had won their first four games but lost three of the previous four coming into the contest at Cincinnati. There was a capacity crowd on hand at Riverfront Stadium. The Bengals scored the first time they had the ball, driving 90 yards. Anderson completed a five-yard touchdown pass to HB Lenvil Elliott to cap the series, although the extra point attempt failed. The Bills responded with a 28-yard John Leypoldt field goal to make the score 6-3 after one quarter. In the second quarter, HB Stan Fritts extended Cincinnati’s lead with a one-yard TD carry, this time followed by a successful PAT. Simpson, who had 154 yards in the first half that included runs of 59 and 44 yards, kept the Bills in the game. He contributed a two-yard scoring carry to narrow the tally to 13-10. But Anderson, consistently finding the weaknesses in Buffalo’s pass defense, threw to WR Charlie Joiner for a 20-yard touchdown and the Bengals carried a 20-10 lead into halftime. Simpson again scored a touchdown for Buffalo in the third quarter, this time from a yard out, to again make it a three-point contest. Dave Green was successful on a 28-yard field goal attempt later in the period, but the Bengals lost star WR Isaac Curtis with a twisted ankle midway through the third quarter. 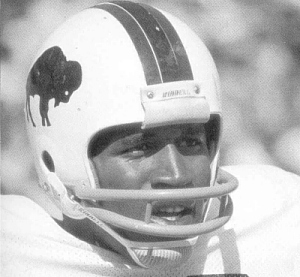 Another one-yard scoring carry by Fritts extended Cincinnati’s lead in the fourth quarter, but Buffalo fought back and closed the margin to six points with eight minutes remaining in the contest when QB Joe Ferguson connected with WR J.D. Hill for a ten-yard TD. The Bengals came back with a 79-yard drive that concluded with a Green field goal of 18 yards and, with 1:57 remaining to play, and that sealed it. Cincinnati came away the winner by a final tally of 33-24. The Bengals generated significantly more total yards (553 to 335) and first downs (34 to 20) – this despite Buffalo compiling 242 rushing yards. The Bengals never punted although Dave Green kicked two field goals in three attempts. There were just three turnovers, with the Bills accounting for two of them. 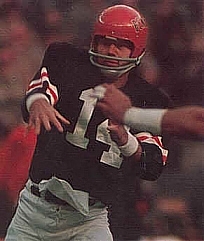 Ken Anderson completed 30 of 46 passes for a career-high 447 yards with two touchdowns and no interceptions, breaking his own club record of 352 passing yards against the Oilers in 1974 with his precision throwing. Isaac Curtis had 7 catches for 139 yards before having to leave the contest and WR Chip Myers added 7 receptions for 108 yards. FB Boobie Clark paced the ground game with 60 yards on 16 carries and also pulled in 6 passes for 64 yards. For the Bills, O.J. Simpson (pictured below) had an outstanding performance with 197 yards on just 17 rushes that included two short TDs. Most of his productivity came in the first half. FB Jim Braxton added 40 yards on 10 attempts. Joe Ferguson was successful on 9 of 18 throws for 106 yards and a touchdown with no interceptions. J.D. Hill was the top receiver with three catches for 33 yards and a score. The win put the Bengals in a first-place tie with Pittsburgh atop the AFC Central, but they lost at Cleveland the next week and once more in the Week 13 showdown against the Steelers to end up second at 11-3. In the Divisional playoff round, Cincinnati was eliminated by the Oakland Raiders. Buffalo, continuing to suffer from defensive lapses, finished third in the AFC East with an 8-6 record. Ken Anderson led the NFL in passing for the second straight year (93.9 rating) and also topped the league in yards (3169) and yards per attempt (8.4). The 26-year-old in his fifth year ranked second in attempts (377), completions (228), and completion percentage (60.5) and was selected for the Pro Bowl. O.J. Simpson was ahead of his record-breaking 1973 pace following the game against the Bengals but came up short, although by a league-leading 1817 yards on 329 carries (5.5 avg.). Altogether, he scored 23 touchdowns, at the time a single-season NFL record.